Imagine every day tasting fresh, fabulous food prepared by an outstanding French chef. For residents of Hillcrest in La Verne it isn’t a dream. Their executive chef is Christian Laire, who was born in Lyons, France, and was educated in the French system of culinary education known as Culinary Aptitude. Although he earned his culinary certificate at just 17, he actually knew his way around the kitchen far earlier. One day with his parents away on an errand, he opened a can of peas for his two brothers and him to eat. What was remarkable is how he prepared the peas. “I added a little bacon, some onion, a little flour for texture,” he said in his soft-spoken French accent. He was 12-years-old. Once overcoming his still boyish reaction that cooking was “women’s work,” he enrolled in culinary school at 14 and graduated three years later. After apprenticing in Lyons, he worked in restaurants in France and Switzerland before moving to Los Angeles when he was 32. “I like diversity,” said the slender and smiling chef, with an ever-present twinkle in his eye. 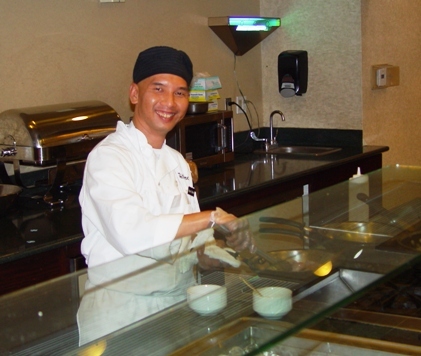 Here in the Southland, he again put his culinary talents to work at several popular dining establishments from Mi Piace in Pasadena to Le Chene in Canyon Country, all the while studying nutrition, health and wellness and the role food can play in helping people achieve a happier and more active lifestyle. When Hillcrest began its search for a new executive chef to mirror its concept of total health and wellness, Christian stood out like a fresh garden salad exploding with flavor. Since his hiring, three years ago, Hillcrest residents have been spoiled by the variety and balance of his lunch and dinner offerings. Preparation at the exhibition station. “Balance is an important aspect of cooking and of life,” Christian said. “As a chef, you need to not overpower the natural flavor of your food. You must allow its true taste to come through. Christian knows his diners are happy because he regularly chats with them in the spacious dining room and solicits their feedback. “You’re food is simply the best,” said one Hillcrest resident, dipping carefully into her Dutch apple pie. He also encourages more diffident diners to use the suggestion box for their critiques. In addition to the regular daily menu, Hillcrest features a daily exhibition station for lunch and dinner. Headlining the “Expo” for the week of August 22-28 were flank steak and Caesar salad (Sunday); roast sirloin (Monday); beef Asian salad (Tuesday); chef salad (Wednesday); four cheese pizza (Thursday), Asian stir fry (Friday); and turkey burger (Saturday). Hillcrest also features frequent special occasion menus. 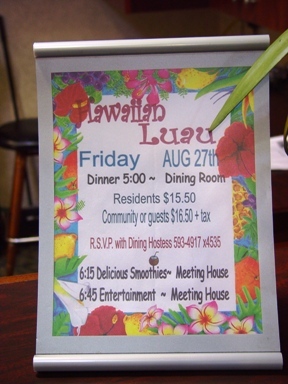 On Friday, Aug. 27, the Luau menu featured organic baby mixed greens with choice of dressings; Hawaiian shrimp and crab salad; grilled vegetables; salmon with tropical relish and mandarin orange sauce; Kalua pig and many other delicious offerings. For dessert, there was a choice of pineapple upside down cake or cheese cake with island topping bar. Christian is no less committed to the satisfaction and happiness of his staff, which includes sous chef Jose and Alma, Eva, Nicolas, David, Gia, Enrique, Jose, Norma, Omar, Melby, Billy and Martin. Every day, their unique talents and collaboration in the kitchen under the direction of Christian make Hillcrest a culinary standout. So not only must Christian be a great chef, he must be a great mentor to his culinary staff. The Hillcrest kitchen is a marvel of organization and cleanliness, adding to the harmony Christian deems so important to creating a culinary connection with diners. Not a pot or a ladle is out of place. Every food item is date-stamped to ensure freshness and safety. In row after row in the stand-up refrigeration section, the beef is kept separate from the chicken, the chicken is kept separate from the fish, and so on. “It’s all about sanitation,” Christian said. “It’s no bother,” dismissing the suggestion that keeping countless logs, files and other paper trails are an occupational hassle. Recently, two of Christian’s grandchildren returned from his native Lyons, raving about the food. “The food in France — the dairy, fruits, the vegetables, the cream – has a little bit more flavor,” Christian said, ascribing the subtle differences in taste to the production methods of French farms that are smaller than their American counterparts. Yet he loves his adopted country and the opportunity Hillcrest has given him to express his passion, on his own terms. It’s been the ideal marriage, like a perfectly prepared chicken tender complemented by a palate-pleasing pineapple mango sauce. As Hillcrest’s reputation for great food offered in a beautiful setting continues to grow, it is hosting more and more large community events. Christian welcomes the challenge of preparing for this new extended family of guests and visitors. 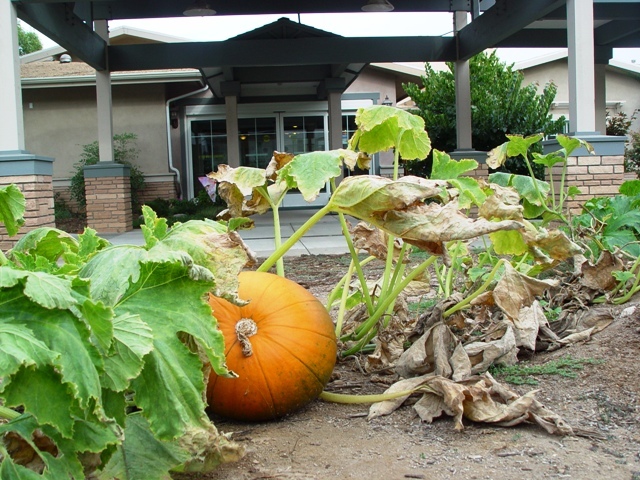 A garden outside the dining hall. “I like the variety and the diversity,” he said. The more who can experience his message of achieving balance, harmony and happiness through the enjoyment of great food, the better. The Meeting House at Hillcrest is a perfect venue to host mixers, business gatherings, retirement parties, luncheons, holiday celebrations, weddings, and graduation parties. The room accommodates up to 400 guests (auditorium style) and 50 to 272 guests for fine dining. Hillcrest’s Catering Services Team, led by Chef Christian Laire, will answer your questions and seek to accommodate personal preferences and requests, including menu items, dessert and beverage selections, and the ambiance to ensure your event is a complete success. For more information, please call Event Planners: Katherine Kahau-Lopez (909) 392-4396 or Karen Clobes (909) 392-4362. The local community is invited to enjoy the food at Hillcrest or many of the other upcoming events at Hillcrest. For more information or a calendar of upcoming events, please call (909) 392-4375. Bon Appetit! Hillcrest is a remarkable 50-acre retirement community in La Verne, featuring new and established residential homes, a beautiful Village Center, a progressive Aquatic and Fitness Center, the Dean Kieffaber Chapel, outstanding healthcare facilities, a fun and varied social calendar of interests and events, and, of course, great dining. 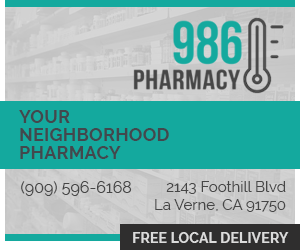 For more information, please call (909) 392-4375.